Colorado Rockies pitchers walked 10 Washington Nationals hitters and threw three wild pitches that led to three runs on Sunday. The Rockies were just 2-for-19 with runners in scoring position in the four-game series in Washington, yet they departed the nation’s capital with a 3-1 series victory. 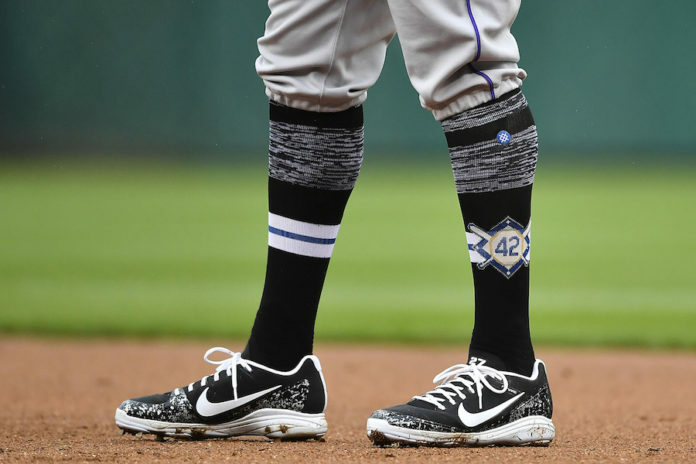 Bryce Harper homered, but it was another longtime National who played the hero on Sunday — Jackie Robinson Day across Major League Baseball. Ian Desmond was 1-for-4 on the day, but his one hit was the biggest of the game. Desmond touched his old team for a solo home run in the ninth inning that proved to be the difference in the game. Desmond spent the first seven seasons of his MLB career in Washington, earning three Silver Slugger awards and a 2012 All-Star nomination. Entering the game Desmond had just one hit in the series, an infield single in the series opener. Rockies starter Tyler Anderson issued six of those troublesome walks, but did not factor into the decision. Harper, the Nationals’ current front man, wasted no time giving Washington hope of salvaging a split in the four-game series when he drove the first pitch he saw from Anderson to deep center field and out, giving Washington an early 1-0 lead. Charlie Blackmon homered for the second time in as many games, driving a solo shot to right field on a 3-2 Stephen Strasburg fastball that tied the game in the fourth inning. It was Blackmon’s sixth home run on the season, second in the NL behind Harper. The walks finally caught up with Anderson in the fifth inning, after he loaded the bases in the inning without allowing a base hit. Anderson issued free passes to Michael Taylor, Trea Turner and Harper, with a sacrifice bunt from Strasburg and a strikeout of Wilmer Difo intermingled. Antonio Senzatela relieved Anderson after the walk to Harper and surrendered two runs on a wild pitch and a throwing error from catcher Chris Iannetta. Anderson’s book closed with three runs allowed (one earned), on two hits and six walks. He struck out six. Strasburg, meanwhile, allowed just one baserunner — the Blackmon home run — through 5.1 innings pitched before Mike Tauchman registered his first hit of the season, an infield pinch-hit single in place of Senzatela. DJ LeMahieu took a walk to put two men on with one out. Chris Iannetta moved Tauchman to third on a sac fly before Blackmon struck again. On a 2-2 count with two out, Blackmon ripped a double down the first-base line to score two runs and tie the game. Carlos Gonzalez followed that with a base hit up the middle to beat the shift and plate Blackmon, giving Colorado a 4-3 lead. The lead didn’t last long, though. Matt Wieters sent the first pitch he saw from Bryan Shaw into the right-center field bleachers to tie the game in the bottom of the sixth. The home run was Wieters’ second in as many games. Shaw surrendered a two-out double to Taylor and walked the pinch-hitting Matt Adams, then advanced them on a wild pitch with Turner at the plate. Turner walked to load the bases, and Bud Black was forced to replace Shaw with Jake McGee. The lefty ended the threat, getting Difo to ground into a fielder’s choice. Brandon Kintzler worked a clean seventh inning for Washington, striking out Trevor Story and Ryan McMahon. 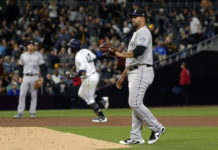 McGee walked Harper to lead off the seventh, but a base-running gaffe by the NL home run leader helped the Rockies wiggle out of the inning unharmed. Harper was running on a one-out flyball to deep center field, and Blackmon quickly doubled him up at first with a relay throw from LeMahieu to end the inning. LeMahieu put his name in the book again in the top of the eighth inning with his fifth home run of the season. LeMahieu took a belt-high, four-seam fastball from Shawn Kelley and put it just over the high fence in right-center to retake the lead, 5-4. Adam Ottavino, who had allowed just two baserunners in 8.2 innings entering the game, hit Wieters with his first pitch, but LeMahieu again worked some magic. Wieters, not known as a speedster, tried to nab second base on a steal attempt and looked to have the base stolen, but LeMahieu picked Iannetta’s throw out of the dirt and laid a brilliant tag on Wieters for the first out of the inning. Ottavino (3-0, 0.93 ERA) struck out Moises Sierra, but Taylor followed that with his second hit of the day — a double scorched down the left-field line. Taylor stole third, then scored on Colorado’s third wild pitch of the game, tying things at five. Taylor’s reaching base also ensured that Harper would bat in the bottom of the ninth. 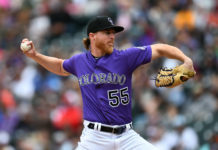 Sean Doolittle struck out the first two batters he faced in the top of the ninth before Desmond drove a 3-2 slider over the fence in straightaway center field to give Colorado a 6-5 lead. Doolittle (0-1, 3.38) took the loss, his first of the year. Desmond did not play in Washington in 2017 when Colorado traveled there; he was shelved with injury. Wade Davis earned two quick outs in the ninth, but faced the ever-dangerous Harper with the game on the line. Davis carefully pitched around Harper with a four-pitch walk. After falling behind Ryan Zimmerman, 3-1, Davis forced a fielder’s choice to earn his NL-best seventh save on the season. Colorado improves to 9-8 on the season with the win. Washington falls to 7-9. NEXT UP: Colorado continues its seven-game road trip in Pittsburgh. The three-game series will put an end to a 17-game stretch without an off day for the Rockies. German Marquez (0-1, 4.97) faces Steven Brault (2-0, 3.46) in Game 1 Monday.